We still have a long way to go, but it’s coming along so lovely I just couldn’t wait to share! So here’s a sneak peek of our fort that we are putting all our extra time into and hopefully you will see the finished version soon! Back in 2003 I made a playhouse for my (then) two children. It was huge and lovely and took a ton of time… but heck, I was in the house I was going to live in forever, so it was well worth it. 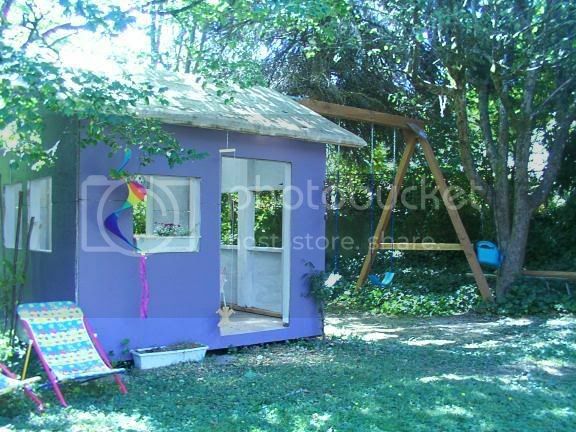 Fast forward 9 years, and we moved from that house soon after that playhouse was finished. It wasn’t the plan, but it is what ended up happening, and for the next few years we were playhouseless. We have two kids that never even lived in that house we thought we would be in forever, and now we own a house that we have spent a lot of time these last three years making our own. This summer we decided to tackle making a fort for the kids in an unused corner or our 1/4 acre lot. It required lots of inspiration. I even made a Pinterest board for it. But it was super cost prohibitive and we were working with all cash. 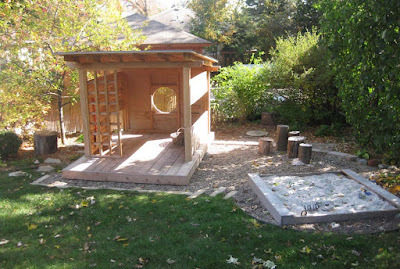 But for now, our project is the playhouse in the far left corner of the yard. We had some ideas… but first we needed to tackle the floor of the playhouse, which is basically a deck in a corner that is on a steep hill. We tried to put in the posts and build the deck ourselves. That didn’t workout so well… and then had to pull the whole thing out. Yeah, cemented 4X4’s are not fun to pull out. So we called in a professional friend to help us make it ‘plumb’ and ‘square’ and we were on our way. I also wanted a slide for the kids as we don’t have a flat place for a play structure, and I really was unsure that we could pull off the second design without needing marital counseling afterwards. Seriously. The Man just about choked when I told him I may pick that one. It was the perfect mesh of the designs I loved most with a touch of whimsy AND a slide. AWESOME! And even better yet, she has step by step instructions right on her blog! I don’t think I could have wished and prayed for a more perfect solution. The only difference between ours and the one pictured is that the deck is 2 ft less in length (hers is 8x10ft) and the slide has to go in the front because the deck is surrounded by bushes on three sides. Other than that, we are following the instructions step by step, and I even bought the same interior paint color. (cuz it’s that cool!) I can’t wait to share it! So far it looks good and every time we pull of any piece of the project without a squabble I feel absolutely triumphant! I can’t wait to show you what we have done. The roof goes on this weekend! Dice onion, garlic, carrots, celery and sauté in olive oil until carrots start to go soft. Add in zucchini, kale, herbs, and mix. When zucchini starts to go soft, add in chicken stock and tomatoes and boil for 5 minutes. Turn down to low and salt to taste. Allow flavors to mingle for at least 5 more minutes. I serve with rosemary diamante bread from Essential Baking or a fresh baked loaf of my own artisan bread right out of the oven! Hot days. Warm nights. Camping. Field trips. Yard work. Gardening. Legos in the lawn. Blueberries. Trimming bushes. 90*. Shorts and tanks. No shoes. Pulling up spent peas. Browning grass. Building forts. Learning to use a miter saw. Planning for classes. Iced coffee. More camping. Cut flowers. Summer colds. Farmers market. Summer. I harvested my onions this week! As the tops started to droop, I pushed over the rest of the tops and let them sit in the ground for 3 days in the hot sun. Then I moved them to an old screen door I laid between two saw horses and set them to cure. Generally curing takes a week or more. They must be out until all the green in the stems is gone, the roots are dry and brittle, and the onion skin is good and papery. They are fine to use while waiting for them to cure, but until they are cured, they do not store well at all. In my case, I will go out and get one off the curing screen when I need one. I turn them every few days to make sure all sides dry evenly and when the tops are brown and dry I will braid some to give as gifts to neighbors and friends. Even though Marianne never actually praises wildflowers in the pages of the Jane Austin novel, any romantic will remember the line in the movie as Marianne tries to sooth Willoughy’s bruised ego with his wildflower bouquet next to the beautiful ‘hothouse’ flowers from the Cornel. And to be quite honest, I agree with her! Queen Anne’s Lace, Sweet Peas, Tansy, and a few others beckoned me from the side of the road today on my way home from a coffee shop. I wished I had my camera at the time to truly capture these beauties in their fields along side the grasses that have all gone to seed and set my allergies to fits. I collected handfuls of them with thousands to spare. They sure are lovely! Some wild and a few from the garden make this beautiful bouquet for the mantel. Nature sure does know how to make a beautiful centerpiece! Here is a few more that I collected from between the roadside and my garden beds that I have just loved decorating my tables and mantel with. Volunteer sunflowers that are producing like mad were the main face of this bouquet with Queen Anne’s Lace and Tansy along side. This was a birthday bouquet for my friend and neighbor. I added “Orange Devil” Crocosmia that just started blooming in my front flower beds. It was a lovely addition! I have a Blue Angel Salvia that is close to bloom too and I can’t wait until I can add that to my bouquets! I highly encourage anyone who may see Daisies, Queen Anne’s Lace, Tansy, or any other local wildflower on the roadside to at least stop and take a look. I love to use wildflowers for any of my bouquets. There is SO much beauty to be had by what Mother Nature has already put in her vast gardens! See me? I am awesome. I am also super big. I serve my own meals. But only when my parents are too slow. I find things that have been put up. They must have been saved just for me. My parents are so nice! I love to just chill with my snack and watch the people around me work. I am a great observer. Out in the yard by myself. I go to daring heights to show people my skillz. I am super good at playing with marbles. I don’t even put them in my mouth, except that one time. I am also the best foreman in town. I told mom how to build that whole playhouse from my fort. The saw was scary, but the drill was fun! Mama wouldn’t let me have it though. She gets so touchy sometimes. Sometimes people in my house decide to go somewhere else without me. I let them know that is not ok. This is my hangout. You can only come in if I say you can. I was gonna get a K9 but mom made me put him back. Yeah. My groove is all that. I run this joint. Somewhere over the rainbow - Cyan turns 11!! Some highlights from Cyan’s ‘Sky & Rainbow’ party. This party was simple and lovely. The decorations were fresh flowers and cardstock fan rounds put up behind the dinner table. Dinner was ‘make your own’ kebabs, rainbow fruit kebabs, and burgers from the grill. I made a rainbow punch from sprite and fresh fruit. The make-your-own kebab station was also a rainbow of wonderful fruits and veggies to grill up with the burgers! …and the kids absolutely loved them! The flowers were the main décor. I bought a few colors I didn’t have (orange and purple mostly), but much of these beautiful bouquets were from my own flower beds! Next up we had a big, fat, backyard dance party. Cyan picked all the tunes and the girls danced, then ate, then danced some more. They are now in the stage where they teach each other dance routines to their favorite songs and it was so fun to watch! No ends of giggles for the mamas that hung around. We all remember being 11. And just look at Luke! In the middle of the party, dancing his little heart out. So cute! Each layer was a 1/2 of a cake batter recipe. I covered the whole thing in real buttercream icing from this recipe and put it in the fridge for a day and a half until the party. The layers were also buttercream. The day of the party was not super warm, so the cake was safe to sit out on the table during the festivities. However, just in case you want to make your own, I have heard that real buttercream doesn’t like to sit in the hot hot sun so I would keep it in the fridge until just before cutting. The craft was making rainbow makers to hang in the girls windows. I had gotten each girl a rainbow maker crystal, a sucker hook, and a crystal bead and placed them inside rainbow colored silk bags. However, this is where Cyan started to feel ill. So we rushed through this part of the party and went quickly to cake and gifts so the girls could all go home. Poor sweet girly… she felt so awful at this point. She didn’t even have a bite of the beautiful cake I made. Everyone else went home just after cake time, and Cyan went to bed. 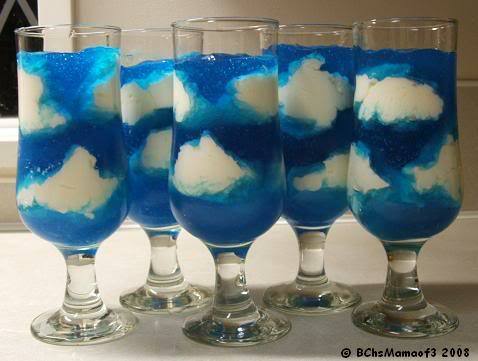 In going along with this ‘sky’ party theme, I thought it would be fun to have these from Pinterest. However, I couldn’t make 15 of those in cups so I thought one big one in a trifle bowl would be just as pretty.